With both glorious sunshine and bitter winds, spring has felt like as Jeckyll-and-Hyde as ever this year. I guess one of the universal rules of fishing is that you have to adapt to the conditions; or save your efforts for another day. Those first really hot days of the year can be a golden chance or a false dawn, in fact. 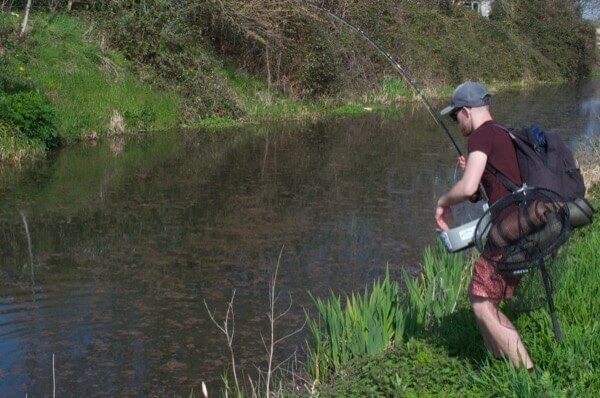 The sun will often bring the fish up on the canals, for example, but the waters can turn as murky and troubled as Brexit for a while, as I found out on a quick trip to the Taunton and Bridgwater Canal. The idea was to meet up with Jack Welshman (above), a talented young fly angler who won the 2018 Fly For Coarse contest with an incredible canal rudd. I belatedly gave him his prize (a Tenkara rod), but the fishing looked a bit iffy. 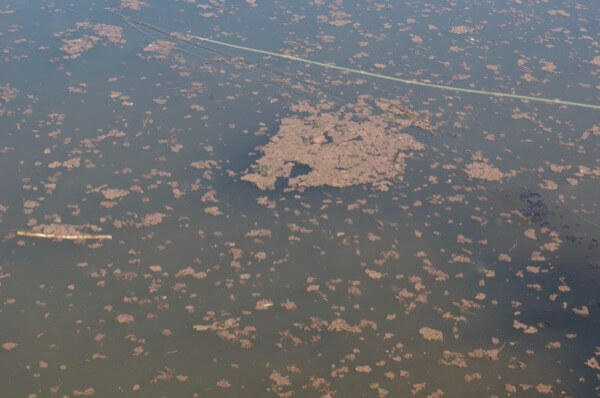 Sure, it was warm and we could see small fish basking; but there was lots of floating sediment on the water and the good sized fish seemed to be missing. Nevertheless, we had a wander and with a bit of trial and error we hit on the right spots and fly patterns. In particular, bright flies seemed to work best, with red or gold the winners. Jack’s own patterns are fantastically simple: just a few wraps of red wire on a hook, with or without a dark, soft hackle. Other hugely successful recent patterns for me have been a small Diawl Bach with a bright red holo rib, and a bright gold bodied Spider I’ve been experimenting with (above). I’m tempted to call this latter fly the POP Spider, or Piece-of-Piss Spider, because it’s golden in colour and such a cinch to tie! It’s literally just a few wraps of Hemingway’s Buzzzer Rib body in Black/Gold, a speck of their UV dubbing and a hen hackle (I was generously given some bits of Hemingway’s fly tying materials from FliesOnline to mess with, and these have been excellent so far). I find sizes 14-18 most useful for both these flies, depending on the size of fish you encounter (although if I’d tied them in 20s I’d have had some bleak and smaller roach too!). Looking at the water, you can see why a bit of extra colour was required! Actually, you would have struggled with conventional coarse tackle- even with just a single fly it was a case of clear a bit of weed off the line every few casts. It’s so often a confidence thing though- so don’t be put off if your local lake or canal looks a bit muddy. The fish will still be able to find that fly if you put it in the right place. Fishing shoulder to shoulder with another angler, you quickly note the differences in your approaches. 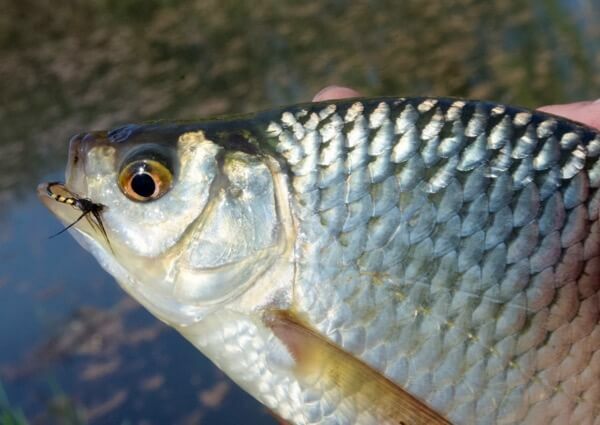 While I tend to fish nymphs with little or no retrieve for rudd, for example, Jack quite often adds a twitch or two, especially when they’re in more aggressive pre-spawn mode. He also packs a line basket- something I don’t usually bother with, but perhaps I ought to, given my big feet and their propensity to step on fly line. There were lots of bleak and small rudd about, but these were quite spooky, even with just a three or four weight line. Any major slap-down on the cast and it tended to be game over! Before too long, though, I managed a rather light, silvery coloured rudd- or perhaps a rudd/roach hybrid?- on my gold bodied spider. We kept spooking small pike, too. Jack had caught a couple of jacks himself before I arrived, but had been struggling with the perch in the bright sun. His leaded flies worked for the silver fish though- and their faster sink rate than my spiders seemed to make them a good shout for roach. It was turning into a nice little session, then, but where exactly were those big rudd we both hoped for? They can be elusive at the best of times- and of course, there’s no guarantee that last season’s hot spots are still as good next time. We did find some slightly better fish in the end, picking off a nice half-pounder each in quick succession, before time ran out on me. It had been a good session if not a long one, though, and the couple of hours flew by as we shared swims and compared notes. One of the best things about this expanding fly fishing scene is the lack of secrecy and snobbery and it’s fantastic to see other anglers really taking to it. 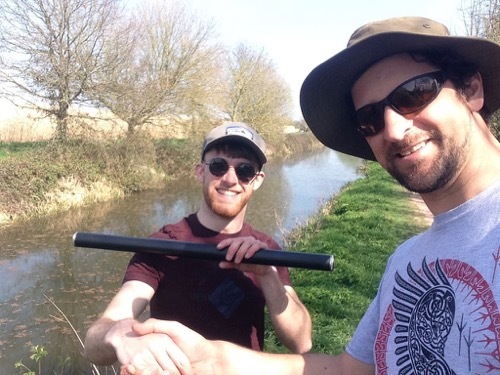 Jack has had everything from specimen perch to reservoir tench on the fly- and it will be interesting to keep in touch and see how his fly fishing journey progresses, especially with that new Tenkara rod! Watch this space at flyforcoarse.com for updates on the 2019 contest. There’s already a new gallery section up, but I’ll be giving things a shakeup, too this year. 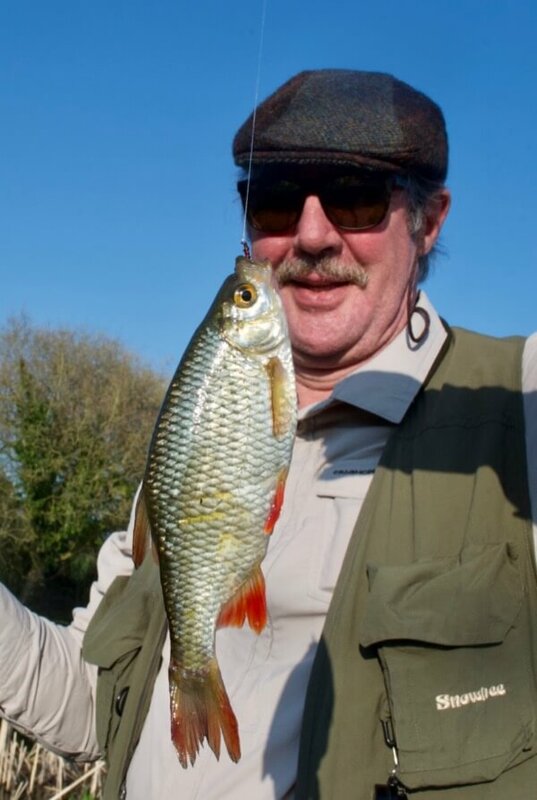 One thing I’m considering is a contest for fly anglers to write a great article about their fishing experiences for coarse fish- as I’m especially keen to encourage anglers to write and I’m sure fellow judges Matt Hayes and John Bailey would also be hugely supportive of this. 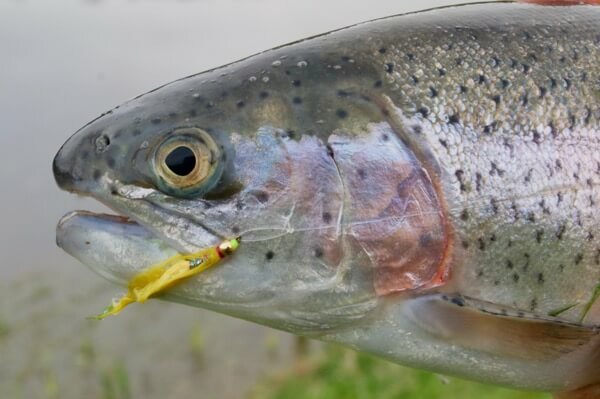 Another big highlight of every spring is the start of the trout fishing season and a busier time for guided fishing trips. In many ways these are the perfect antidote to the rest of my work in angling. As much as I love to write, it can be quite a solitary, lonely affair. I cherish every day out on the bank, then, even when I don’t fish myself. 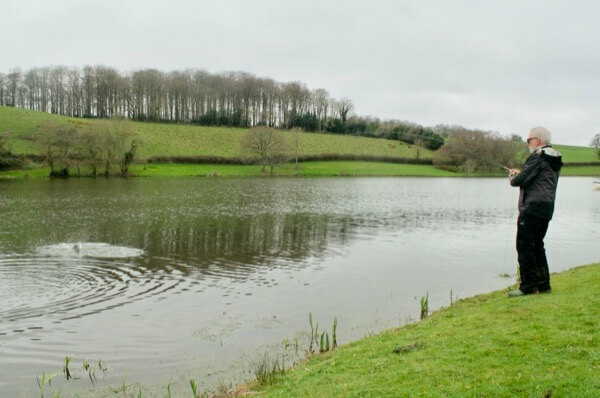 The guided angling sessions take me all over Devon and Somerset, too, and every day is different. 90% of my clientelle still want to learn fly fishing or improve their skills. I do get some pike angling bookings, or kids wanting to learn coarse fishing, but with the exception of sea charters, bait fishing is still a long way behind in UK guiding. Brendan Sweeny was one of my recent charges, who met me on a delightful looking Hawkridge Reservoir. 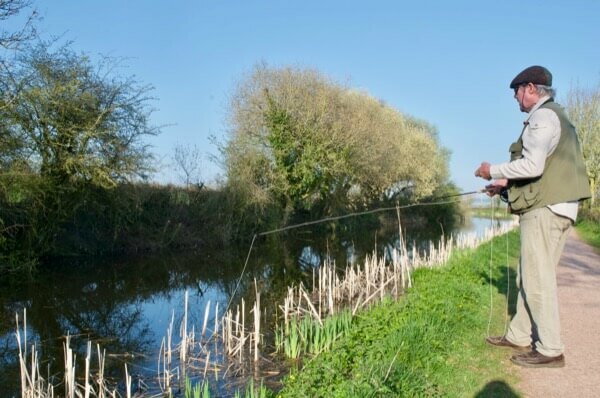 He hadn’t cast a fly in anger for at least a couple of decades, but was keen to get back into it and his daughter had booked him a guided fishing trip as a birthday gift. Nor could we have picked a better day, with a mild, overcast day and just the right amount of breeze. I fancied the fish to be up for the chase and willing to come close to the bank, and so it proved. In no time, Brendan was casting cleanly and getting follows. A typically fit rainbow broke the duck, before things slowed and we took a walk. Good move, because the little bay round the corner was rammed with fish. Fishing on the “shoulder” of the bay made perfect sense- any fish coming in or out will pass right by you. We tried a few flies, as I was keen to show Brendan different options and tactics. The lures were king, though, and Mini Dancers, Kennick Killers and other lively flies were all excellent. My charge left very happy in the end, with a bulging bag of great trout! All were rainbows, although we did spot a real beauty of a brown trout passing, too, which must have been all of 6-7 lbs. Next time! Finally, it has also been an interesting start to the river trout season, if a bit furstrating. 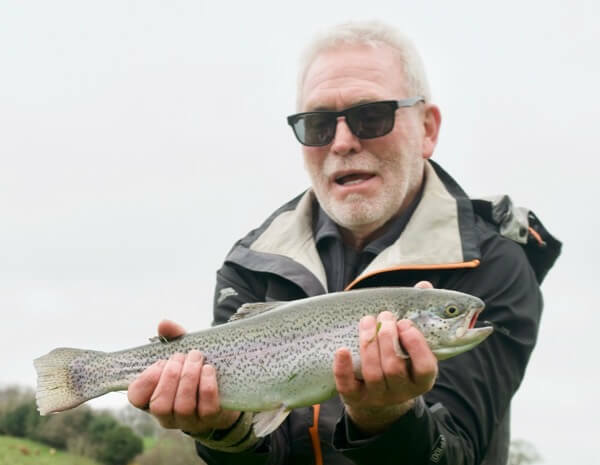 My own fishing was rained off, sadly, but the timing was better for John Whelan, who fancied a mixed day of fishing for both trout and some coarse fish. 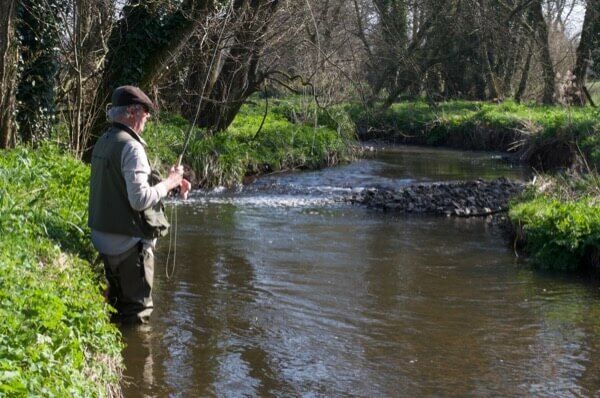 We began on the Upper Culm (on the Westcountry Angling Passport), which was pretty but testing. Indeed, sometimes it is about imparting those vital skills, rather than catching a shed load of fish. With a bit of practice and a few pointers, John was soon side casting and flicking little roll and catapult casts into tight spots. I think he found it challenging and intimate to say the least! The fish hardly rose all day, although we did see a couple of giant stoneflies. Nymphs were the way to go in the end- and even with these, the fish seemed to want them deep and presented close to the snags and corners in the pools and tumbling water. John had three nice takes- and a fish that came off. Hard luck this time then, but the main thing was that after a morning’s tuition he was now reading the water and making chances with little need for me to prompt him, which will surely set him in good stead for the rest of the season. Just to show him what else was on offer locally, I also got him a day ticket for Tiverton Angling Club so we could stop off for a couple of hours on the Grand Western Canal after lunch. This was looking a little green, like the Taunton to Bridgwater Canal. I’m told it’s the Benthic Layer changing over (sounds clever, but I was enlightened on this term by my friend Andy Parkinson on this, who knows a thing or twelve about fisheries and what goes on beneath the water!). It happens every spring and it doesn’t make for easy fishing. That said, I was still confident there would be fish right at the surface on a sunny day, and so it proved. I think John took a little adjustment to spot and cast to them; and indeed to strike without needing to see the fly! So often, it’s a case of keeping an eye on where you think the fly is (you will lose sight of a small one!) and striking at any fish that rises, turns or starts to gobble! 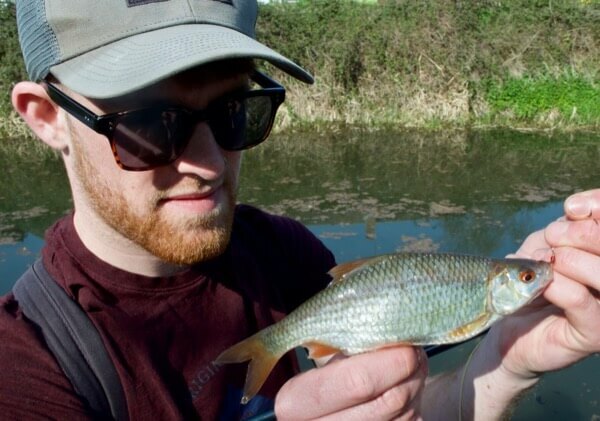 He took well to this and had three lovely rudd in the end, all to a red Holo Diawl Bach (as pictured earlier in the blog). A great way to end our session, not to mention a much deserved reward to sharpening up his casting and listening to my yabbering all day! Should you want to book a guided day’s fishing, just drop me a line (see my guided fishing page). I cannot guarantee the fishing will be easy, but I can always ensure that you have an enjoyable day where you learn a lot. Otherwise, don’t forget you can catch me every week in Angling Times (some interesting fishing at Darracot Reservoir for carp and perch coming up, among other issues! 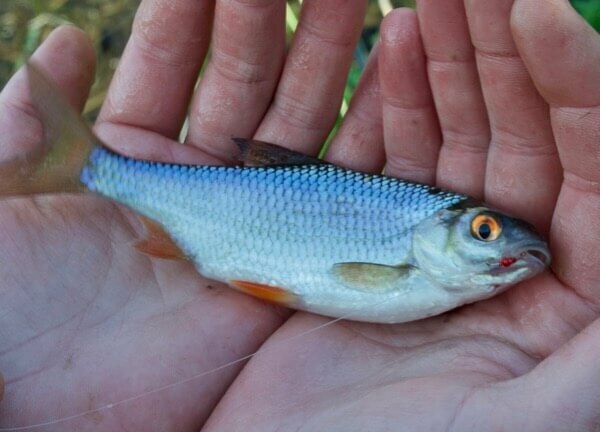 ), and also regularly on the Angling Trust’s “Lines on the Water Blog“.